You can enter a patient's dental and medical insurance information into his or her patient record. Note: All required patient information (name, gender, birth date, and address) must be entered before you can attach insurance to a patient. To attach insurance to a non-subscriber if the subscriber is a patient of your practice, you must have a patient record created for and insurance attached to the subscriber before you attempt to attach insurance to patients of record who are on that subscriber's plan. To attach insurance to a non-subscriber if the subscriber is not a patient of your practice, you must have a patient record (with a status of Non-Patient) created for and insurance attached to the subscriber before you attempt to attach insurance to patients of record who are on that subscriber's plan. On a patient's Overview page, in the Insurance box, click (or tap) Add. On a patient's Insurance Information page, click (or tap) Add Plan. The options for entering insurance information become available. If the patient is the subscriber for the plan that you are going to enter, leave his or her name in the Subscriber box. 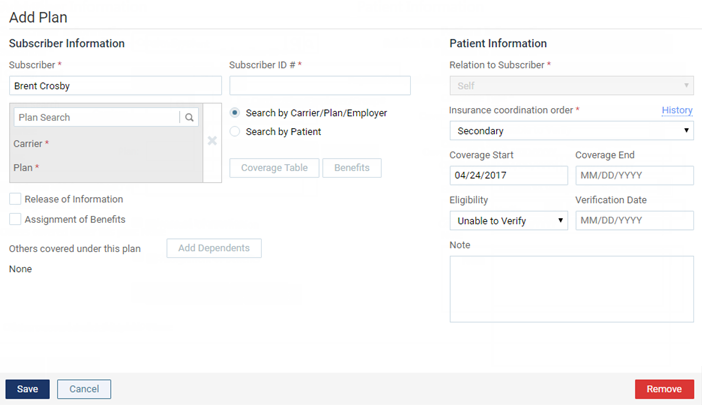 If the patient is the subscriber, use the Plan Search field to search for and select an insurance plan. In the Plan Search field, begin typing a carrier name, an employer or group plan name, or a group number. Continue typing as needed to narrow the results list, and then select a plan. In the Plan Search field, begin typing a patient name. Continue typing as needed to narrow the results list, and then select the patient with the correct plan. If there are no results for the search criteria that you enter in the Plan Search field, click (or tap) Add New Carrier or Plan. Select an insurance carrier from the list of carriers that have already been added to your practice database. To add an insurance carrier to your organization's database, click (or tap) Add Carrier, begin typing a Carrier Name to search for a carrier from the database of supported nsurance carriers, continue typing as needed to narrow the results list, and then select a carrier. Alternatively, you can type the name of a carrier that is not supported. For a non-supported carrier, type the carrier's phone number and extension (if applicable), fax number, and website address. Then, click (or tap) Save. Enter the plan or employer name, group number, insurance carrier's address, phone number and extension of the insurance plan administrator, fax number of the insurance plan administrator, name of the insurance plan administrator (or contact person), email address of the insurance plan administrator, benefit renewal month, source of payment coverage type, PPO contracted fees, and fee schedule of co-payments (for capitation plans only). Also, type any notes regarding the plan. Set up the rest of the options as needed, such as the subscriber ID, relation to the subscriber, coverage type, and coverage period. Subscriber ID # - The ID used to identify the subscriber of the insurance plan on claims submitted to the corresponding carrier. The subscriber ID might not be the same as the subscriber's Social Security number. Release of Information - The subscriber authorizes the release of information to the practice. With this check box selected, "Signature on File" appears in box 36 on insurance claims. With this check box clear, box 36 is blank. Assignment of Benefits - The subscriber authorizes payments from the carrier to go directly to the provider. With this check box selected, "Signature on File" appears in box 37 on insurance claims, and the carrier will send payments to your practice. With this check box clear, box 37 is blank, and the carrier will send payments to the subscriber. Relation to Subscriber - For a subscriber, since he or she is the current patient, Self is selected automatically and cannot be changed. For a non-subscriber, select Spouse, Child, or Other. Coverage Type - The coverage order of the plan (such as Primary or Secondary). The number of items that are available on the list depends on the number of plans that have already been set up for this patient. If there are no plans, only Primary is an option; if there is one plan, Primary and Secondary are options; if there are two plans, Primary, Secondary, and Tertiary are options; and so on. Coverage Period - In the Coverage Start and Coverage End boxes, enter the date that coverage started and, if known, the date that the coverage will end for the subscriber and all patients who are insured under the selected plan. For a non-subscriber, you can specify an end date that is before or the same as that of the subscriber. Eligibility - If known, select the patient's eligibility status: Unable to Verify, Eligible, or Ineligible. Then, enter today's date (or the date that eligibility was actually checked). Note: Changing the eligibility status here affects the patient's eligibility status for his or her appointments on the Insurance Eligibility page and vice versa. Note - Any notes regarding the insurance plan. Click (or tap) Coverage Tables to edit the coverage table for the insurance plan. 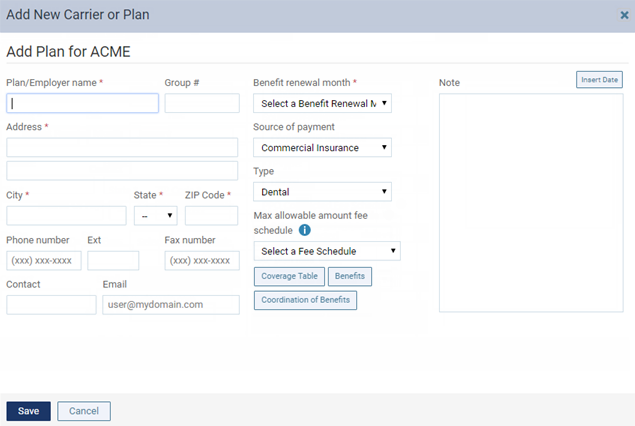 Click (or tap) Benefits to edit the deductibles and benefits for the insurance plan. Access to the deductibles and benefits is available only if a subscriber and a plan have been selected. When you attempt to access the deductibles and benefits, if you have not already saved the plan, a message appears and states that you must save the plan before you can access the deductibles and benefits. Click (or tap) Yes to save the plan and continue. How do I put in a waiting period on insurance?